Hot summer weather and good summer vibes can only mean one thing: festival season is well underway. In a little less than a week, I will be traveling to Bonnaroo. Bonnaroo is not your typical music festival. The 4-day weekend experience is held every year in Manchester, TN. Its home for one weekend every year is at Great Stage Park, a 700-acre farm. This makes Bonnaroo the largest outdoor festival in the country. The festival welcomes a wide range of genres of music, featuring a lot of indie rock, electronic dance music, hip-hop, reggae, country, and everything in between. The lineup this year is stacked with a lot of different performers. Headliners include Eminem, The Killers, Muse, Future, Bassnectar, Sturgill Simpson, and Bon Iver. The bill runs deep, too, with a lot of great lesser-known bands making an appearance. Recent WSUM favorites like Japanese Breakfast, Post Animal, Moses Sumney, Thundercat, and Pond are making an appearance at the festival. Those are just five of many hidden gems across the lineup. Bonnaroo is a world all its own. While the music is the primary focus of the festival, the grounds host a whole lot more than just a couple of stages and tents. The experiences and the community found at Bonnaroo are unlike anywhere else, and I just want to highlight a few things I’m really excited for on the farm. Not only do Bonnaroo attendees get to see some of the best music today’s festival circuit has to offer, they also get to be in the great outdoors for a weekend. The camping experience at Bonnaroo is as atypical as it gets. Rather than a campsite, you are placed in a pod (of which there are 12), which is basically a sea of tents all next to one another. Each pod has a central plaza, with wifi, amenities, bathrooms, and such. The weekend forges a strong sense of community, where campers frequently visit with and get to know their neighbors and fellow festival-goers. The campsites are filled with parties into the night from the night you arrive until the end of the weekend, and it’s a really unique social environment you can’t find anywhere else. Bonnaroo runs and thrives on a strong sense of community and positivity. The festival doesn’t take their motto “Radiate Positivity” lightly. Trust me, if you attend Bonnaroo, your hand will be sore at the end of the weekend from how many high-fives you receive. There is an overwhelmingly positive atmosphere at the festival. You won’t run into a group of immature festival attendees rudely pushing their way through a crowd at Bonnaroo. The vibe and culture of Bonnaroo are respectful, joyous, upbeat, positive, and fun. The friends and memories you make on the farm are ones that you wouldn’t soon forget. Aside from the music, there are plenty of things to do around the festival grounds throughout the weekend, and there really is something for everyone. At Yoga-Roo, you can find great yoga classes all weekend for a relaxing and productive break from the party. If you’re into fitness, Bonnaroo also organizes a Roo Run every year: a 5K that runs around the expansive festival grounds. You can participate in the Bonnaroo census, too! Bonnaroo takes a census of its attendees every year and finds out why they attended Bonnaroo, what music they like, and just more info about the diverse group of attendees. According to their website, you can look at past census results, enter a song into a community playlist, and get to know your fellow festival-goers that way. You can also find plenty of spontaneous events that happen throughout the weekend. One of these that I read about on Reddit is a onesie party that happens late Saturday night in Centeroo. So if you’re into that, go for it. There’s plenty of late night activities other than the stages as well. A few tents around the grounds throw all-night dance parties with DJs. For a bit of a break, visit Plaza 7, better known as The Grove. It’s a calm oasis filled with hammocks and hanging lights: perfect for a mid-Roo nap. In Plaza 9, Matt Schultz of Cage the Elephant is hosting a special Bonnaroo celebration all weekend. On Friday night, T-Pain is hosting karaoke. There’s also a block on the schedule from 12:30-5:30 AM labeled “Pineapple Party”. I’m not too sure what that means, but given Bonnaroo’s track record of crazy experiences off the beaten path, I’m sure that the Pineapple Party isn’t to be missed. Most music festivals are held in urban areas these days and therefore suffer from strict city curfews. Whether it’s Lollapalooza in downtown Chicago or Life Is Beautiful on the strip in Las Vegas, most festivals wrap up by 10 or 11 PM. This is not the case at Bonnaroo. Because they’re on a farm with no major city around, Bonnaroo really takes it late into the evening. The headliners for each night wrap up at around midnight, and after that, the late night shows begin. These time slots are coveted and cherished, and really provide some of Bonnaroo’s most memorable shows. This year, some late night highlights include Chromeo, Virtual Self, Bon Iver, and What So Not. These sets will end at 3:15 AM each night, but the party doesn’t stop there. 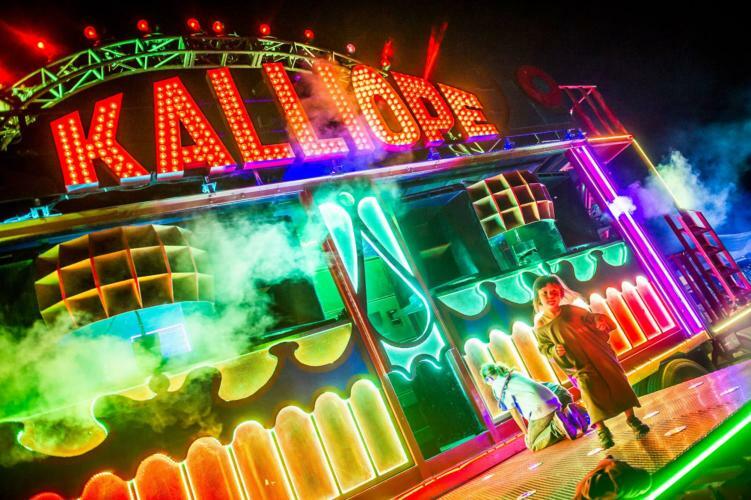 This year marks the return of the Kalliope, a special moving stage that sets up somewhere on the farm each night. The mobile stage comes with a booming sound system and exciting pyrotechnics. It hosts a variety of guest DJs that aren’t announced until the night of. Usually, the Kalliope brings surprise special DJ sets from different artists across the lineup. However, the stage also hosts surprise guests not originally listed to play the festival. A few years ago, Bonnaroo attendees were surprised with back to back late nights from Skrillex and Griz. I’m sure Bonnaroo has a surprise up their sleeves for this year, too. Another unique musical experience that is special to Bonnaroo is the Superjam. This is a one-time combination of artists who put on a special show around a certain theme. This year’s theme is “Into the Great Wide Open: A Tom Petty Superjam”. It will be a moving performance celebrating the life and music of Tom Petty, featuring a wide array of artists in the supporting cast. Members of My Morning Jacket, Wilco, Young The Giant, are joining Bonnaroo artists like Sylvan Esso, The Revivalists, Moon Taxi, Japanese Breakfast, and Durand Jones. This list will also be added onto by special guests who make an appearance the day of. This spontaneous jam session is unmissable. Stay tuned for more Bonnaroo coverage from WSUM! Next week we’ll post our artist preview article. Look out for live coverage from the festival at @wsum91.7 on Instagram.